MissMuffcake: I Love Cats & Toys! I Love Cats & Toys! When I was in the Disney Store a few weekends ago doing some shopping for a friend I came upon a giant plush cat. 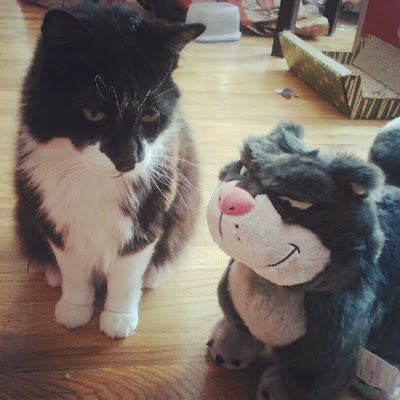 I asked who the cat was and was told Lucifer - how could I pass up a giant plush kitty with so much attitude? Mar approves of Lucifer! So add Lucifer to the cool cat club! Mar voted him in! Aw, such cuteness! I love that picture of them together. What a great buddy for Mar.